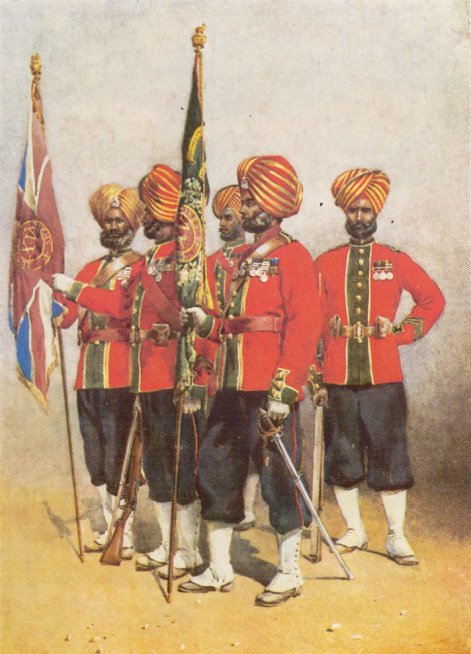 The 155,000 strong regular Indian Army of 1914 originated in forces recruited by the Honourable East India Company in the mid-eighteenth century to protect its property and interests. 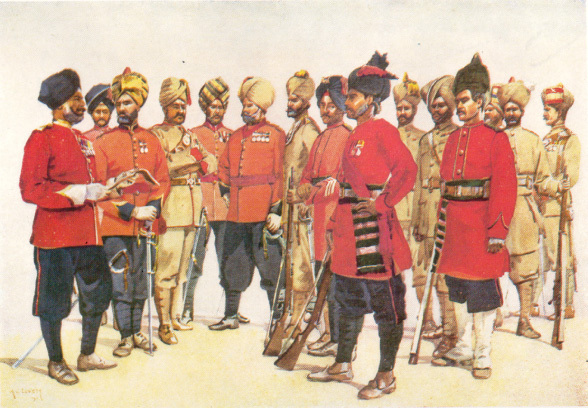 After the Indian Mutiny of 1857-58 these forces were transferred to the British Crown. 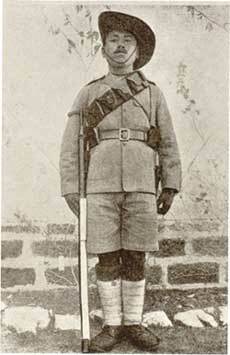 The army was composed entirely of Indian (and Gurkha) volunteers serving under a small number of British officers. 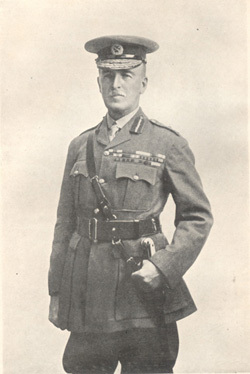 Alongside them, Indian officers fulfilled the role of junior officers in the British Army, commanding platoons and so forth. 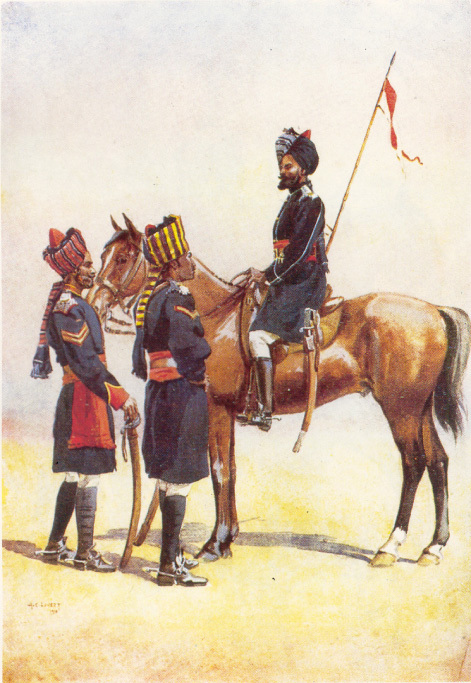 These officers – holding the Viceroy of India’s commission rather than that of the King- or Queen Emperor – were almost all promoted from the ranks. 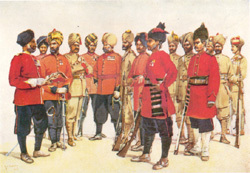 For the British officer or Indian soldier, acceptance in a regiment of the Indian Army meant joining a close-knit family. 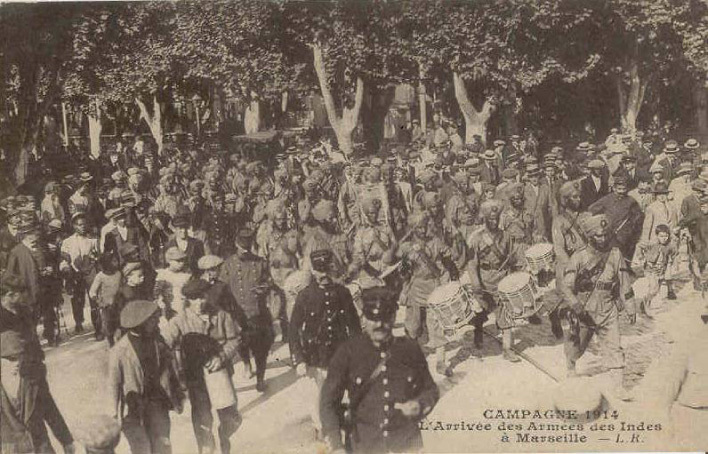 Many men spent their career in the same battalion, joining as boys and leaving to retire. Indeed, sons followed fathers into family regiments generation after generation. 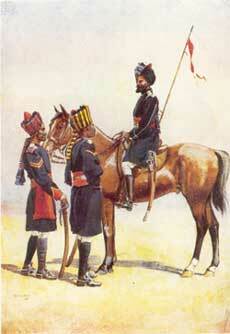 In many of the cavalry regiments new recruits brought their own horses and equipment. Izzat is the Indian term for that essential sense of loyalty and honour that drives a soldier to fight: the case of the Indian Army is slightly obtuse in that Indians volunteered to police and even to enlarge the British Empire. This says much for the strength of the regimental system, shored-up by the financial benefit and social prestige that the Indian soldier took home to his village in the form of pensions, grants of land for distinguished services and campaign medals and decorations as tangible evidence of martial skill and personal bravery. The Indian Army’s primary roles were defence of India’s borders and internal security. 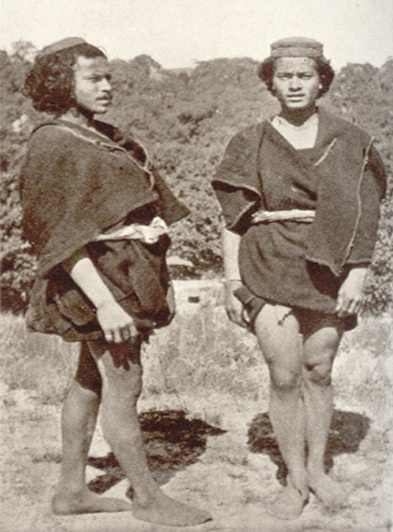 It was the “mainstay of Colonial rule” according to historian David Omissi, contending that British rule of what can be construed as occupied territory would have been quite impossible without the Indian Army effectively policing its own people on behalf of the occupying power. However, the Indian recruit also signed on for overseas service wherever the Emperor required him, and from time to time Indian troops were called to serve abroad, including campaigns in Persia, China, Abyssinia, Sudan and East- and West Africa. The First World War, as will be demonstrated, was something on a different scale, however. The Indian Army favoured the so-called “martial races” of the north of India, preferring to recruit yeomanry stock from the rural agricultural community or tribesmen from the wild Northwest Frontier region. Yet the illiterate but hardy peasant, used to relentless, uncomplaining work on unsympathetic land, was also considered fine raw material for the army. 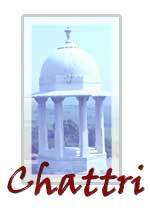 From the tough Gurkha of Nepal and the Garhwali from his northern hill state, to the well-educated Madrassi of southern India, the Army included dozens of tribal classes and religious sub-groups: Punjabi Mussalmen (Muslims), Pathans, Dogras, Mahrattas, Jats, Sikhs and indeed combinations of the above all served shoulder to shoulder in the Indian Army. 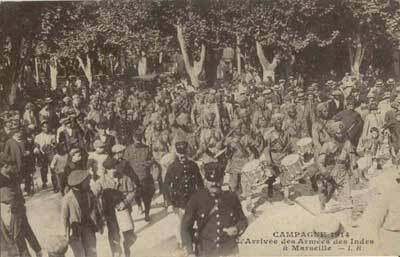 Even before the declaration of war regiments began to prepare with enthusiasm. As with the British Army in England, the regiments had to be brought up to war strength by the recall of those on leave and reservists. Unlike in Great Britain, however, many of these lived out of reach of posts and telegraphs, so parties were sent out to collect them in. The travails of these parties were increased by heavy rains that had made the Indus almost impassable. Despite these obstacles, the Indian Corps embarked at Karachi within two weeks of Mobilisation. A month later they were landed on French soil.